Anne Sheridan is on a mission when she makes Aliyah to Israel. After an unexplained icon appears on her computer screen, following the suspicious death of her husband, she wants answers. But Anne has a secret of her own. Through a complicated twist of fate, her arrival in the Holy Land sets in motion a chain of events with fearful consequences of international proportions. Caught in the middle of a struggle between the Israeli Government and a feared Hamas terrorist, her quest takes a dangerous detour. Her only hope for survival is to examine her heart and place her faith in God. Ari Milchan, the intriguing Major of the Israeli Defense Force further complicates her dilemma. Can the two of them overcome ancient religious and cultural barriers for a chance to love again? Will Anne's secret bring redemption or heartache? 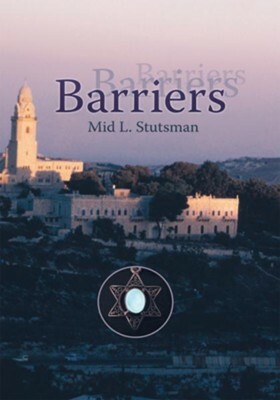 Barriers begins with excitement on the first page and takes the reader on an exhilarating journey through present-day conflicts in Israel. With lyrical prose, Mid Stutsman weaves together an unforgettable story of faith and love. A compelling book--as if ripped from the daily headlines exposing the raw reality of the age-old conflicts of culture and religion written with poignant relevance. Barriers reveals a tender heart established with unmistakable love and zeal for Truth. I'm the author/artist and I want to review Barriers - eBook.